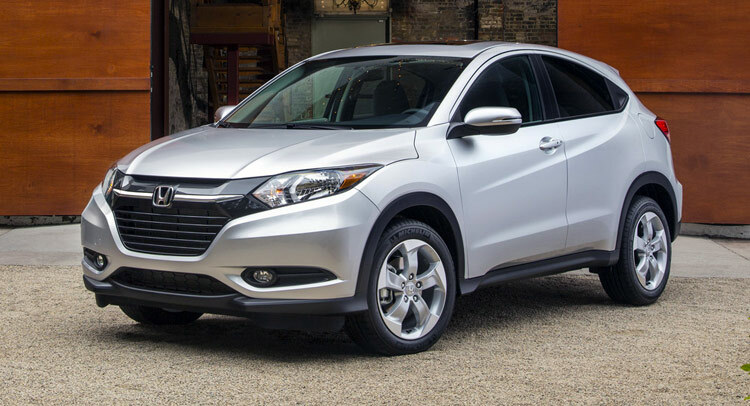 Compact crossovers are all the rage right now, and the 2016 Honda HR-V enters the marketplace at a crucial time. This class only had three or four entries just a year or two ago, and the number of players should double this year. That equates to an estimated 236,000 sales of B-segment CUVs in 2015, more than twice last year’s sales, according to AutoPacific data. Honda joins a growing list of automakers looking to cash in on expanding sales. Fiat-Chrysler has its adorably Italian Fiat 500X and tiny-tough Jeep Renegade siblings. Chevy brought its small Trax to the US market from abroad. The Nissan Juke carries on with oddball styling and zippy dynamics. And the small-boxy class sales king Kia Soul could add all-wheel drive model to further increase its appeal. The HR-V doesn’t break any new ground here. It starts with the Swiss Army Knife packaging of the Fit hatchback, then adds a more powerful engine, increased ground clearance, and all-wheel drive. It’s nothing revolutionary, but that’s not a bad thing. In typical Honda style, the beauty lies in the execution.What we have here is an attractive, compact crossover. It looks like a puffed-up Fit, or Honda Fat if you will. At 169.1 inches in length, the HR-V is more than a foot longer than the Fit (and almost nine inches shorter than the original CR-V). But with clean, taut lines that sculpt the body sides the HR-V is anything but bloated. We particularly like the integration of the rear door handles into the C-pillar. This thing is cute, especially with the rounded nose and chiseled rear end. And the chunky, five-spoke, 17-inch alloy wheels we like so much are standard even on the base model. There are a couple of weird bits to the styling. Like the way the hood cutline spills over to the front quarter panel and the oversized, fang-shaped taillamps. But overall the HR-V looks great. It has more modern appeal than the Trax, and while the 500X and Renegade are more interesting to our eyes, the HR-V has plenty of pizzazz for folks afraid of flamboyance. That reserved charm carries on in the interior. Like the exterior, the cabin is a safe kind of stylish. Materials include a mix of fabrics and plastics on the doors, plus obligatory soft-touch surfaces abound because, you know, we’re all in the habit of squeezing dashboards these days. The row of three vents in front of the passenger seat looks nice, and there’s added storage underneath the center console. The seats are comfortable but lack lateral support in the side bolsters. EX and EX-L Navi models add heat to the front buckets, and are just as cozy in leather as the base cloth upholstery.Front and center on the dash is the same touchscreen infotainment interface found in Honda’s newest cars. It’s a clean piece of tech that’s easy to use and packs a ton of functionality. Annoyingly, there’s no knob for the volume control, but redundant steering wheel controls offer easy access for cranking up the tunes. HVAC operations are housed in a second, narrow touchscreen setup at the bottom of the center stack. The intuitive design of both systems is a welcome change of pace from the more confusing dual-screen setups found in the Accord and Odyssey. Where the HR-V truly excels is its packaging – “perhaps its single greatest strength,” according to one Honda executive. There’s a ton of space for rear occupants. With 39.3 inches of rear legroom, the back seats offer more knee space than the CR-V. Plus the HR-V has the Fit’s Magic Seats, which means the rear bench folds, lifts, tumbles, and splits. The end result is cargo flexibility for all shapes and sizes. And the maximum 58.8 cubic feet of space bests nearly everything in the class (the boxy, upright Kia Soul is slightly more capacious). Packaging may be the little Honda’s best talent, but how it moves down the road is equally impressive. The HR-V uses a 1.8-liter inline-four-cylinder engine borrowed from the Civic, good for 141 horsepower and 127 pound-feet of torque. Those are adequate numbers for a car that straddles either side of 3,000 pounds depending on trim level. The naturally aspirated engine lacks the pleasing zing of the turbocharged powerplants used in the Nissan Juke or Jeep Renegade, but the Honda’s motor is smooth and solid – a clear improvement from the anemic 1.5-liter found in the Fit. That’s especially true when mated to Honda’s continuously variable transmission. Power comes on progressively in the HR-V, and the CVT doesn’t cause the engine to drone. This transmission still isn’t our first (or second) choice, but it suits the HR-V’s refined character and helps with fuel economy. Front-wheel-drive models with the CVT return estimated EPA numbers of 28 miles per gallon city, 35 mpg highway, and 31 mpg combined. All-wheel drive – available on all trims – reduces those numbers slightly, to 27/32/29, respectively. Even better than the CVT is the ability to choose your own adventure with a six-speed manual gearbox. It’s limited to base LX and mid-grade EX models, and only with front-wheel drive. Honda’s reputation for great stick shifts continues here – the manual in the HR-V is a pleasure to row through the ratios. Throttle response is linear, matched with a nicely weighted clutch pedal, and the actual shifter action is tidy – no long throws or vagueness here. Fuel misers should stick with the CVT, but the six-speed does offer a respectable 25/34/28 mpg. Regardless of transmission, the HR-V is nice to drive. It’s like a more substantial Fit, with a solid, planted feeling out on the road and with less wind and road noise entering the cabin. Visibility is good, with a large windscreen and relatively low beltline, not to mention Honda’s LaneWatch passenger side camera for added visual support.The HR-V’s steering is weighted nicely and complements the composed, comfortable ride. It’s not crashy over rough pavement, and while there’s more body roll in the HR-V than the smaller Fit, it seems suitable for this application. The brakes never feel touchy around town or vague when stopping from higher speeds. This is not an athletic crossover, but it’s not trying to be one. The HR-V offers better manners behind the wheel than most of its classmates. Buyers looking for more enthusiastic handling should wait for the upcoming CX-3, though if Mazda’s other products are anything to go on, its cute ute will fall short of the Honda’s top-notch functionality. Configuring the HR-V is easy. Prices start at $19,115 for a front-wheel drive LX with a six-speed manual transmission, and there are only a few ways to go up from there. If you want a CVT, that’ll be $800, and if all-wheel drive is a necessity, be prepared to pay an additional $1,250. The EX model starts at $21,165 and includes a bunch of niceties like a power moonroof, heated seats, foglamps, rear privacy glass, automatic headlights, and more. Finally, there’s the $24,590 EX-L Navi which, as its name suggests, gets you navigation, leather seats, roof rails, and satellite radio, among other features. Fully deck out an HR-V with all the goodies and it’ll be $26,720, including $880 for destination.One reason these B-segment CUVs are so popular is the price. Window sticker in the low- to mid-$20,000 range fall right on top of compact sedans. And because younger folks are totally still into cars, these small crossovers offer a more interesting, functional choice than a similarly-priced sedan. Ask yourself: Would you rather have an HR-V or a Civic? A Trax or a Cruze? In those situations, to us, the choice is clear. As the compact crossover class continues its big surge, the HR-V is a strong contender. It’s fun to drive, affordably priced, and continues the Japanese automaker’s long trend of offering excellent packaging and functionality. Small CUV sales are only going up, and this charming HR-V stands to capture a big chunk of that market.